On first appearances they could not be more different – a modern Jihadi woman dressed in plain black, complete with hijab, and a pale English woman in white Victorian dress living 175 years earlier. These stark differences could easily lead to caricature, but Filipa Braganca and Felicity Holbrooke play their parts with such strength and nuance that we are immediately drawn into their separate worlds. And it is the surprising similarity between their situations that is profoundly explored in Echoes by Henry Naylor. Although the two women appear onstage together, they do not speak to each other or relate to each other in any way. What we get instead is a series of short alternating monologues which cumulatively build a sharply detailed portrait of the world these women find themselves in. It is to playwright Henry Naylor’s credit that we learn so much about the historical context of their situations – Victorian spinsters being encouraged to sail to India to marry soldiers and build the Empire, modern day women being radicalised to do the same in Syria. Their situations are grim, as they live in areas of conflict with men who treat them badly. But Henry Naylor also has comedy credentials, including shows like Spitting Image, and manages to lighten proceedings just enough with some well-placed humour. The end result is compelling and thoughtful rather than light entertainment but well worth the price of a ticket. Echoes by Henry Naylor continues at Holden Street Theatres – The Arch, at various times, until Sun 13 Mar. 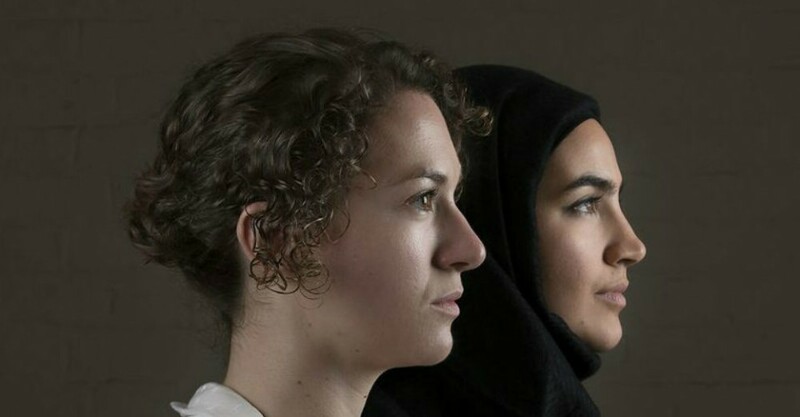 Holden Street Theatres - The Arch, Thu 11 Feb On first appearances they could not be more different – a modern Jihadi woman dressed in plain black, complete with hijab, and a pale English woman in white Victorian dress living 175 years earlier. These stark differences could easily lead to caricature, but Filipa Braganca and Felicity Holbrooke play their parts with such strength and nuance that we are immediately drawn into their separate worlds. And it is the surprising similarity between their situations that is profoundly explored in Echoes by Henry Naylor. Although the two women appear onstage together, they do not speak to each other or relate to each other in any way. What we get instead is a series of short alternating monologues which cumulatively build a sharply detailed portrait of the world these women find themselves in. It is to playwright Henry Naylor’s credit that we learn so much about the historical context of their situations – Victorian spinsters being encouraged to sail to India to marry soldiers and build the Empire, modern day women being radicalised to do the same in Syria. Their situations are grim, as they live in areas of conflict with men who treat them badly. But Henry Naylor also has comedy credentials, including shows like Spitting Image, and manages to lighten proceedings just enough with some well-placed humour. The end result is compelling and thoughtful rather than light entertainment but well worth the price of a ticket. Adrian Miller Echoes by Henry Naylor continues at Holden Street Theatres – The Arch, at various times, until Sun 13 Mar. Book at FringeTIX on 1300 621 255 or adelaidefringe.com.au. Click HERE to purchase your tickets.